Educational video games should take lessons from chess, checkers, and mancala. This blog post originally appeared in the New America Foundation’s Weekly Wonk. I was panicked: I had been stuck at sevens for two weeks and the rest of the class knew it. Each week, all of us third graders took a one-minute multiplication test—Mad Minutes. You started with zeros and if you passed, you moved up to ones, then twos, and so on, until nines. A giant bulletin board on the classroom wall marked our progress, a daily reminder that I alone couldn’t memorize 7x8. Now, whenever I hear about the promise of games for accelerating learning (or, in TEDspeak, the gamification of education) I think back to those Mad Minutes. While they did use many “revolutionary” gamification elements—making the mundane playful, individualizing learning, encouraging competition, rewarding progress—I’ve since wondered whether these elements might not capture the real value of using games to teach. To better understand how education can tap into the potential of games to facilitate learning, we need to stop and ask, what makes games so engaging in the first place? What is so appealing, for example, about jumping round discs over one another in diagonal patterns? Or besting pawns, rooks, and knights on a quest to capture the king? 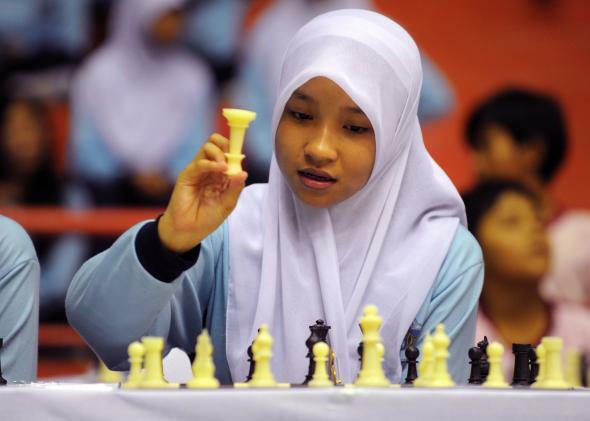 Why have games like chess and checkers endured through the ages, and what can educational games today learn from them? The popularity of classic games worldwide is in part due to the elegant simplicity of the rules that structure their gameplay, allowing players to jump right into formulating their own strategy to win. While the rules for multiplication mandate that 7x8 always equals 56, the rules for chess allow infinite possibilities for play. Because of these infinite possibilities, players must think ahead, anticipate their opponent’s moves, and apply multiple strategies at once in order to win. The Royal Game of Ur, Chaturanga (an ancestor of chess), and mancala are classic examples of games that required strategic thinking and reasoning. Real-world trade routes facilitated the spread of classic games to new regions and peoples, and the best endured: The Royal Game of Ur was first played over 4,600 years ago in ancient Babylon, and is still played today in Israel and other parts of the world. The gaming train started to run off track in the mid-19th century, when the actual business of games was born. In 1860, a lithographer by the name of Milton Bradley made several improvements to the printing process, providing the opportunity for mass-production; this quickly led to commercialization, companies cashing in by offering a dizzying array of choices for leisure and entertainment. American entrepreneurs soon developed new products, with an eye toward connecting game storylines to current events and popular culture: The transcontinental railroad completion spawned dozens of games with train motifs; the Klondike Gold Rush in Alaska and the Battle of Manila were quickly converted into table-top games. Of course, television didn’t help matters. Glitzy, visually appealing games looked better in the breaks between Saturday morning cartoons. As one historian succinctly put it, “[g]ames continued to represent society, but more themes now seemed to be pegged to entertainment and media events than to history and cultural lifestyle.” These mediocre games certainly didn’t require complex strategic thinking to win: Think Rock Em Sock Em, or, worse, the Saved by the Bell game. Of course these new, these flashy new games didn’t unseat the classics—take a trip to Target, and you’ll still find copies of checkers, chess, mancala, Parcheesi. But if you take a look at the educational game market in general—and the iTunes educational apps market specifically—you can see the effect they’ve had: all style, with little substance. So, what are educators today to do? Scrap the new education apps and assign students to play two hours of mancala each night? And what should you buy as a holiday gift for the young learner in your life? While Sushi Monster and Math Drills Lite might not offer the best platforms for deeper learning, some researchers and developers are thinking about the types of games that do provide the same kind of mental stimulation as a regular chess regimen. The iSchool at Syracuse University, for example, is exploring in depth how the unique structure of these classic games actually build brainpower; their research focuses on game design and moving players from short-term, rewards-based gamification into more meaningful gameplay. To be sure, I’m not suggesting that every aspect of classroom learning can be transformed into a Minecraft game. And Mad Minutes might not be a terrible way to incentivize students to learn their times tables—even if they made me break out into hives. But if we want students to want to play—and learn from—educational games, we should take a lesson from games of the past. A good first step is being more strategic about the types of games we give them.